Institute of Graduate Studies and Research, University of Alexandria, Alexandria, Egypt. Copyright © 2014 M. A. Abdrabo, M. A. Hassaan. This is an open access article distributed under the Creative Commons Attribution License, which permits unrestricted use, distribution, and reproduction in any medium, provided the original work is properly cited. In accordance of the Creative Commons Attribution License all Copyrights © 2014 are reserved for SCIRP and the owner of the intellectual property M. A. Abdrabo, M. A. Hassaan. All Copyright © 2014 are guarded by law and by SCIRP as a guardian. The Nile Delta is considered to be one of the most vulnerable river deltas to Sea Level Rise (SLR) in the world. SLR is expected to affect large agricultural areas of the Nile Delta, either through inundation or higher levels and salinity of groundwater. It could be argued that such impacts would augment the problems experienced already in the area in terms of high groundwater table and salinity levels. In order to guide policy and decision making, especially in terms of assessing the economics of various adaptation options, there is a need to provide estimates of potential economic damage that could result from such changes. The paper in hand aims to estimate the economic value of potential primary impacts of higher levels of groundwater table due to expected SLR on agriculture productivity in Damietta Governorate as one of the Nile Delta coastal governorates. To conduct such an assessment, relationship between groundwater table level and agricultural productivity was first investigated in relevant literature. This was followed by reviewing prevailing conditions in the agricultural sector in the study area. Thereafter, a regression analysis for the main crops in the study area, between crop yield and groundwater table levels, was conducted. Based on the developed regression, a GIS (Geographic Information System)-based hydrological model, and a production economic model, were employed to assess economic value of higher levels of groundwater table impacts on agriculture productivity. It was found that future accumulative crop yield loss was estimated, using segmented linear regression, up to the year 2100 to be as much as L.E. 6.43 billion. It is worth mentioning that these estimates do not include indirect impacts of higher levels of groundwater table, which may include loss of jobs and/or earnings, impacts on food supply and food security in the area. A potential adaptation option, namely redesigning and upgrading existing drainage infrastructure, was found to cost a total of L.E. 190.8 million, representing about 4.5% of the estimated accumulative potential damage to agricultural productivity up to the year 2100. Maximum yield of a certain crop requires that, among other things, groundwater table level should be at optimal groundwater table depth, with yield decreasing at higher (deeper) groundwater table depths due to water shortage (saturation) at root region, respectively. Still, the relationship between crop yield and groundwater table level may be influenced by a number of factors including for instance, physical properties of the unsaturated zone distribution of plant roots systems and salinity and toxic ion effects on crop growth . It was suggested that too wet conditions seem to affect crop yield more seriously than too dry ones. This is because poor aeration not only reduces water and nutrient uptake of the crop, but also leads to deterioration of soil structure and slowing down of the nitrogen mineralisation process in the soil . Moreover, excessive water in the whole root zone may inhibit the diffusion of oxygen in soil pores, thus resulting in root death, leaf drop, chlorophyll destruction and a significant reduction in photosynthetic assimilation of the horticulture crops. Also, anoxic conditions may lead to a series of anaerobic decomposition products, including ethylene, which are deleterious to plants not adapted to flooded soil . The aerobic organisms typical of well-drained soils are replaced in flooded soils by anaerobes, primarily bacteria, which cause de-nitrification and reduction of Mn, Fe, and S .
However, flood tolerance varies greatly with plant species and genotype, rootstock, age of plants, time and duration of flooding, and condition of the floodwater [6-10]. Furthermore, the optimum groundwater table depth will not only be a function of crop type, but will also be a function of soil and climatic properties . In general, when a shallow groundwater table exists, yields of most crops can be related to the depth of the groundwater table. The yield-groundwater table depth curves are different for different crops and soils, but their general shape is the same . For most crops, there exists some groundwater table depth, at which aeration, moisture, and nutrients are such that crop yields can be maximized. When the groundwater table rises above this threshold, crop yields begin to decline. Waterlogging, for instance, may reduce root growth of most woody plants by inhibiting root formation and branching, growth of existing roots and mycorrhizae and cause root decay [6,13-15]. Waterlogging may decrease reproductive growth of crops as it often inhibits flower bud initiation, anthesis, fruit set, and fruit enlargement in woody plants. It also induces early abscission of flowers and fruits1 . Also, waterlogging often lowers fruit quality by reducing fruit size, altering the appearance of fruit and changing its chemical composition . Grain yield can meanwhile be affected by groundwater table depth and waterlogging duration, with the maximum yield being reached at an average depth of 125 cm, and at deeper water levels it declined slightly due to shortage of water . Rice has a reputation that it can tolerate waterlogging and some submergence as paddy rice or deepwater rice, because of its ability to transport oxygen efficiently from the aerial parts of the plant to the roots . This means that rice, contrary to other major crops, can generate high yield when grown in waterlogged soil . However, it is not well adapted to several days of sudden inundation and complete submergence, which could be fatal and significantly decrease grain yield, particularly when plants are small [19,20]. Mediterranean coastal plains and lower Delta are experiencing significant seawater intrusion into the aquifers. Soil salinization is another issue of concern in these areas due not only to seawater intrusion but also to irrigating using low quality (saline) water, as they are located at the downstream regions of the system, and inadequate field drainage . Therefore, it was argued that SLR, in the Mediterranean, may adversely affect agricultural production and water resources in the Mediterranean low-lying coastal areas, unless measures to protect vulnerable land or other land management schemes are put in place . The Nile Delta in general and its coastal areas in particular are already suffering from increasing and salinizing of groundwater table, with the aquifer being recharged by infiltration from a network of irrigation conduits and excessive flood irrigation water. It may also be recharged by flow coming from the Nile Valley aquifer . It was estimated that a 50 cm rise in the Mediterranean Sea level will cause additional intrusion of 9.0 km in the Nile Delta aquifer, rendering the Nile Delta aquifer more endangered under climate change and SLR conditions. Additional pumping will cause serious environmental effects in the case of the Nile Delta aquifer . Sea level rise (SLR) is one of the direct impacts of climate change, which can have a wide range of implications on health, tourism, agriculture as well as other fields. It may, generally, affect agriculture located in coastal areas in four different ways namely: increased frequency and magnitude of extreme weather events, inundation, higher salinity of groundwater, and higher levels of groundwater table. Such impacts can contribute to considerable damages in terms of agricultural productivity and impose certain changes in crop patterns. This can, on one hand, adversely affect income and employment opportunities in the agriculture sector and threaten food security and consequently increase malnutrition in the area, on the other hand. It is expected that projected rise in sea level during this century will have profound impacts on agricultural production in the northern areas of the Nile Delta. Such impacts would be ranging between increase inundation risks, rise in level and salinity of groundwater. This would consequently cause, depending on crop patterns, significant decline over the years in agricultural yields. Inundation of low lying lands would lead to loss of such areas, whether they are being used for agricultural activities, as built-up areas and/or being undeveloped. The paper in hand is focusing on impacts of SLR induced higher groundwater table levels on agriculture. Thus, impact of SLR induced inundation of agricultural land is out of the scope of this research work2. 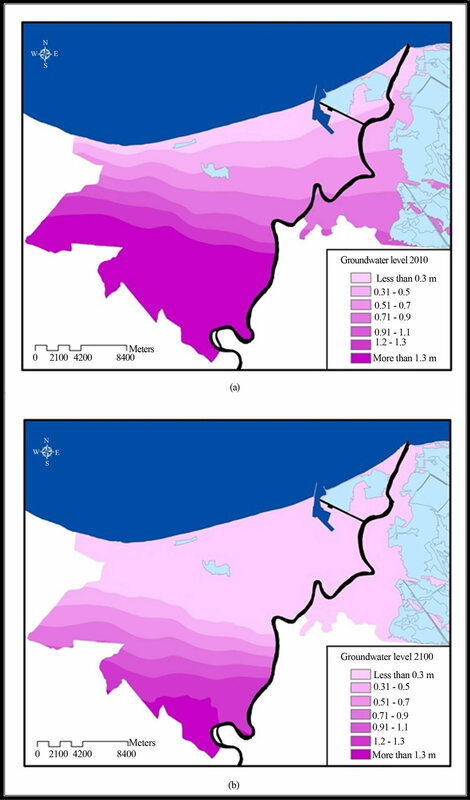 The main objective of this study is to estimate the economic value of potential impacts of higher levels of groundwater table due to saltwater intrusion associated with expected sea level rise on agriculture productivity in Damietta Governorate as one of the Nile Delta coastal governorates. Attaining such an objective entails developing a methodology with a number of assumptions to simulate future context. Damietta governorate, the study area, is located in the north eastern part of the Nile Delta covering a total area of 734 km2 with a total population of about 769,000  and . 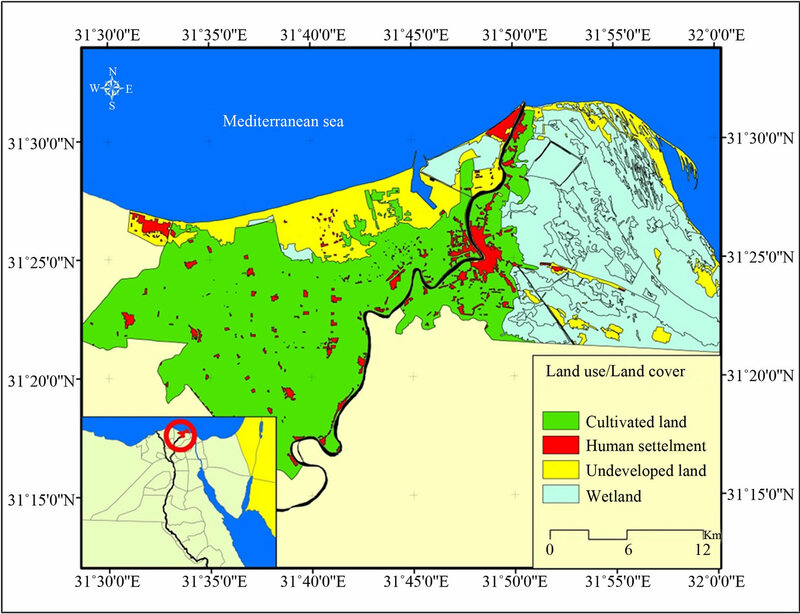 Administratively, the study area is divided into two main districts namely; Damietta and KafrSaad, which are further subdivided into 33 localities. Land use patterns of the study area reveals dominance of agricultural land in various parts of the study area (Figure 1), with about two-thirds of the study area representing about 76,266 acre, is agricultural land . • Rising groundwater table levels. • High salinity of the mixed Nile irrigation water and drainage water4. The major cropping seasons are the winter (extending from November to May) and the summer (extending from May to October) seasons. Another marginal season is the Nili season (early autumn season), named after the annual Nile flooding, or late summer season (extending from August to October). The main winter crops are wheat, barley, Egyptian clover (Berseem), broad beans and vegetables, and the main summer crops are cotton, rice and maize . Figure 1. Land use patterns in the study area. buting to runoff and seepage losses and consequently to current high groundwater levels. In the case of the Nile Delta region, no significant change in meteorological parameters, especially perception and soil is mainly clay with small patches of sandy soils close to the coast and that agriculture is irrigated. It could be argued that these variables, as well as farming practices, would be expected to have limited effects on the relationship between crop yield and groundwater table level. Moreover, as discussed above, two limiting groundwater table depths are typically considered: an upper limit to create a soil that is dry enough for performing farming operations and has a favourable aeration of the root zone, and a lower limit that is set by the water requirements of the crop, with an optimum between the two. For the purpose of this study, and as all cropping area under consideration is flood irrigated, the upper limit of groundwater table level is the one considered for this work. The study methodology is based the employment of two models; the first of which is a GIS (Geographic Information System)-based hydrological model, calibrated from current extensive field data was used to project groundwater table levels at future points of time; in the years 2025, 2050, 2075 and 2100. The second model is a production economic model, which is based on the relationships, expressed as regression line, between crop yield, for a variety of crops and groundwater table depths. The estimated change in crop yield (which is the difference between potential production under current conditions and production under higher groundwater table levels induced by sea level rise) was then converted into monetary terms using current market prices. The GIS first manipulated the raster surfaces representing hydrologic model to identify and projected groundwater table depths at field level (Figure 2)5. The resulted groundwater table depths layers were overlaid on cultivated land for each crop. The resulting data were thereafter used to estimate the impacts of expected groundwater table level on crop productivity, which was then used to estimate changes in crop yield. • Cropping area, of each crop, was fixed over the study duration, which excludes the effects of urban encroachment on agriculture land. This could be justified by the need to focus on the impacts of changes in groundwater table levels due to SLR. • Cropping patterns prevailing in the area will not experience any significant changes in the future6. Despite being a strong assumption, it is considered to be necessary for “before and after analysis”, as it would allow for estimating the actual cost of changing groundwater levels induced by SLR without autonomous actions by individual farmers. • Area cultivated by each crop is equally distributed among various levels of groundwater table, which means that it is proportionally distributed along various groundwater table levels. Due to the quite diverse range of crops cultivated in the study area, a number of which are marginal, it was decided that crops occupying less than 2.00% of the cropping area would not be considered in this study. 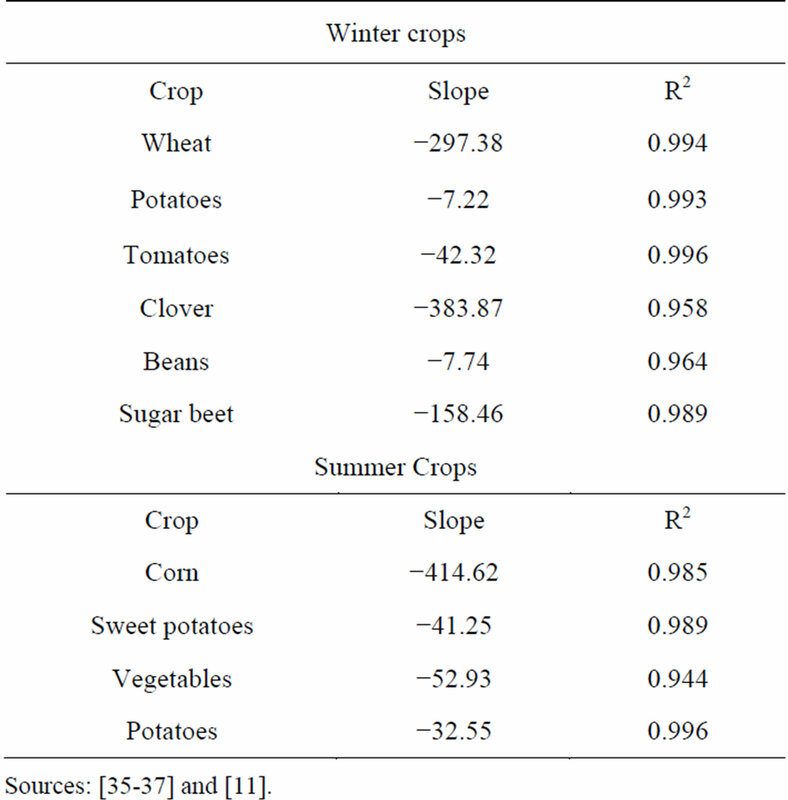 The remaining crops, covered by this study, included seven winter crops and six summer crops representing about 98.48% and 78.47% of the total cultivated areas in winter and summer, respectively (Table 1). It was not possible, in the case of rice and fruit trees, to estimate the change in crop yield due to projected groundwater table levels. This is due, in the case of rice, to crop yield being affected only by waterlogging when the whole rice plant is submerged (see for instance, [17-20]). As such data was not possible to acquire, the extent of change in rice yield due to changes in projected groundwater table level was not possible to estimate. Furthermore, despite the presence of extensive literature on the impacts of high groundwater table levels on fruit trees, no evidence was found in the literature identified the causal relationship between fruit trees yield and groundwater table levels. This was found to be the case except for the very high levels of groundwater (10 cm or less), which would lead to fatally injure the trees [28-34]. In the case of impacts of high groundwater table levels, the economic loss may include the reduced yield as well as the cost of plant treatment and extra care. The economic loss, in the case of fatally injured tree plantation associated with very high levels of groundwater table levels, may include the cost of the sapling, the special efforts devoted to care for the young plants as well as the lost income for the early years of plantation. Figure 2. Groundwater table depths current and projected in the year 2100. (see Table 2). These numbers were used, through segmented linear regression method, to develop regression relationship between crop yield and groundwater table levels. 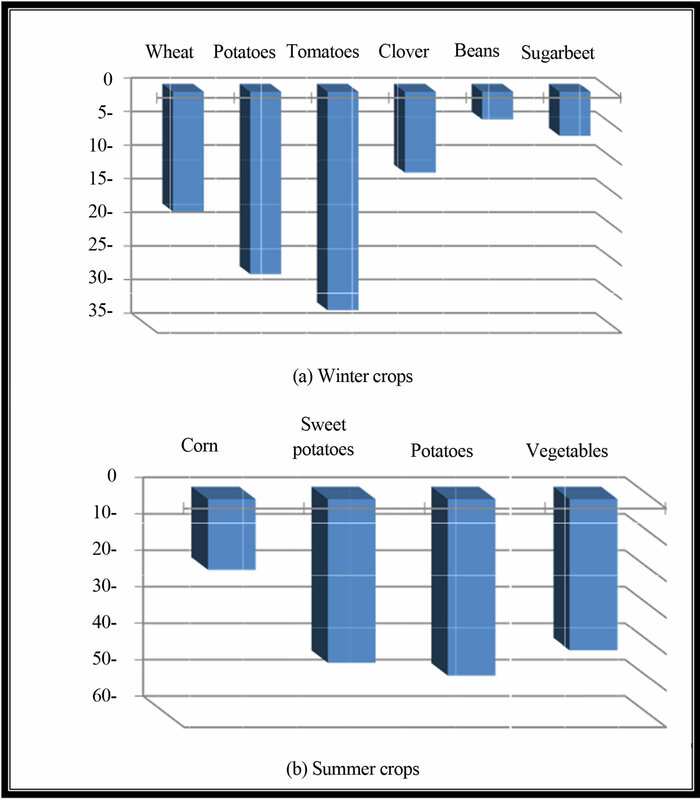 The estimated thresholds and slope parameters for all relevant crops is shown in Table 2. Table 1. Crop pattern in winter and summer seasons. Table 2. Estimated crop yield as a function of groundwater table levels. According to such estimated relationships, accumulative values of present and future crop yield under projected different groundwater table levels, up to the year 2100 were estimated. The total loss in agricultural yield due to high levels of groundwater table was estimated as the difference between potential (under present conditions) and future accumulative yield values. It was found that accumulative crop yield would expected to decline from present yield values of L.E. 11.99 and 11.52 billion to 10.25 and 4.69 billion by the year 2100 for winter and summer crops, respectively. Such decline represents projected decline in crop yield values of 14.4% and 40.8% for winter and summer crops, respectively (Table 3). The overall decline in crop yield values due to higher groundwater table levels is estimated to be as much as L.E. 6.43 billion up to year 2100. It is worth mentioning that, as impacts of higher groundwater table levels on tree and rice plantation, were not incorporated in the above estimates, these estimates represent underestimates of impacts of higher groundwater table, induced by expected rise in sea level, on agricultural yield in the study area. 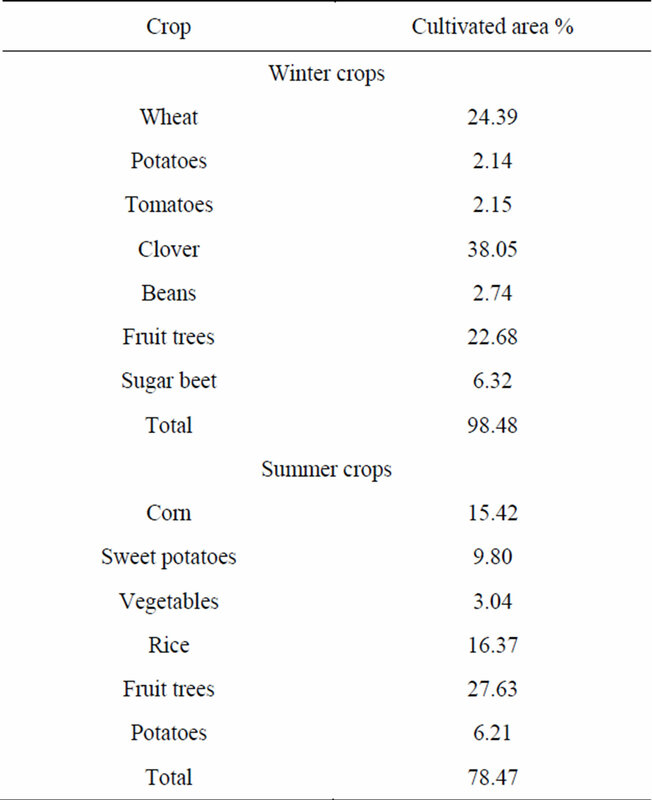 It was noted that the decline rate among winter crops was found to be more varied ranging between 4.1% for beans and 32.5% for Tomatoes, compared with 19.4% and 48.4% for corn and potatoes for summer crops, respectively (Table 3). Yet, according to absolute figure, the decline in the accumulative yield value up to the year 2100 was highest in the case of clover, followed by wheat, with a total of L.E. 1.16 billion, which represents about 76% of the total decline in the accumulative yield value in all winter crops up to year 2100 (Figures 3(a) and (b)). This may be attributed to the large areas cultivated by these two crops, which represented 62.4% of the total cultivated land in the study area. Additionally, these two crops showed the steepest slopes of regression line relationship between crop yield and groundwater table levels among all crops, accounting for. Such steep slopes reflect higher levels of sensitivity to groundwater table levels. In the case of summer crops, the decline in the accumulative yield value up to the year 2100 was highest in the case of sweet potatoes and potatoes, with an estimated decline of as much as L.E. 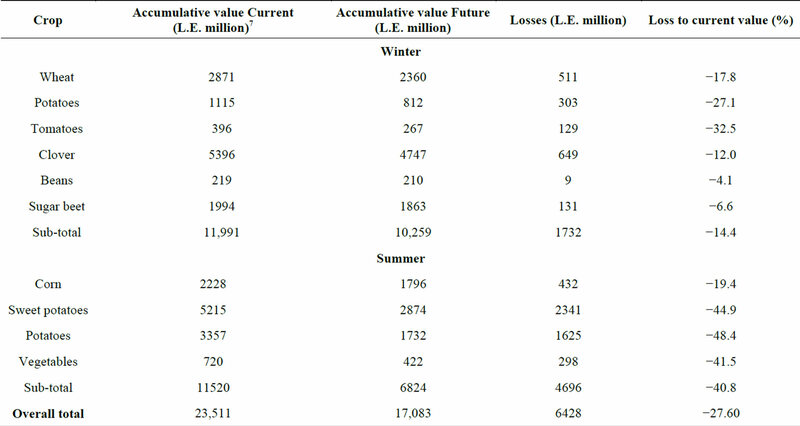 3.966 billion representing 84% of the total decline in the accumulative yield value in all summer crops up to year 2100. This may be explained by the relatively high prices of these two crops compared to other summer crops. For example, the price of potatoes was significantly higher compared to other summer crops studied. Table 3. Accumulative crop yield estimation at present and projected up to the year 2100. Figure 3. Proportional accumulative loss to current value of crops yield up to the year 2100.
struction of a subsurface drainage system in the area as well as upgrading drainage water pumping stations to meet expected increased drainage inflow. The costs of implementing such an adaptation option, at current price levels, ranged between L.E. 91.4 and 101.0 million for dredging and installation of subsurface drainage system. There is also the cost of upgrading drainage pumping station, which was estimated to be about L.E. 190.8 million . This means that costs of adaptation, in the case of constructing subsurface drainage system along with upgrading drainage water pumping stations, represent about 4.5% of the accumulative potential damage to agricultural productivity up to the year 2100. Agricultural activities are expected to be considerably affected by higher levels of groundwater table induced by sea level rise. Based on projected levels of groundwater table at various points of time in the future, future accumulative crop yield was estimated, using segmented linear regression up to the year 2100. The overall decline in crop yield values due to higher levels of groundwater table was projected to be as much as L.E. 6.43 billion up to the year 2100. It should be stated that the figures presented above of projected decline in crop yield up to the year 2100 are underestimates of the potential decline in agricultural yield in the study area. This is because they do not take into account the decline in the crop yield in the case of rice of fruit trees. Furthermore, the economic effects of such decline in crop yield does not capture the indirect effects of such a decline in terms of loss in income and job opportunities in the agricultural sector and related activities (e.g. transportation and trading). Also, it is worth mentioning that sharp decline in some crop yields may lead farmers to abandon growing such crops and go for more resistant crops to high groundwater table levels. This could represent a problem in case the abandoned crops are considered to be essential for food security in Egypt. As for potential adaptation of redesigning and upgrading existing drainage system, it was found that it may represent an economically feasible option. This research work is part of a research project sponsored by the IDRC-Canada for establishing Alexandria Research Center for Adaptation to Climate Change. R. A. Feddes, “Effects of Drainage on Crops and Farm Management,” Agricultural Water Management, Vol. 14, No. 1-4, 1988, pp. 3-18. E. A. Graser and L. H. Allen Jr., “Water relations of 7-Year-Old Containerized Citrus Trees under Draught and Flood Stress,” Proceedings of Soil and Crop Science Society of Florida, vol. 47, 1998, pp. 165-174. T. T. Kozlowski, “Responses of Woody Plants to Flooding and Salinity,” Tree Physiology Monograph No. 1, 1997, pp. 1-29. T. T. Kozlowski, “Soil Aeration, Flooding and Tree Growth,” Journal of Arboriculture, Vol. 11, No. 3, 1985, pp. 85-96. T. T. Kozlowski, P. J. Kramer and S. G. Pallardy, “The Physiological Ecology of Woody Plants,” Academic Press, San Diego, 1991. R. A. Feddes and A. L. M. Van Wijk, “An Integrated Model-Approach to the Effect of Water Management on Crop Yield,” Agricultural Water Management, Vol. 1, No 1, 1976, pp. 3-20. T. T. Kozlowski and S. G. Pallardy, “Physiology of Woody Plants,” 2nd Edition, Academic Press, San Diego. 1997. T. T. Kozlowski and S. G. Pallardy, “Growth Control in Woody Plants,” Academic Press, San Diego, 1997. L. Cavazz and P. Rossi Pisa, “Effects of Watertable Depth and Waterlogging on Crop Yield,” Agricultural Water Management, Vol. 14, No. 1-4, 1988 , pp. 29-34. E. S. Dennis, R. Dolferus, M. Ellis, M. Rahman, Y. Wu, F. U. Hoeren, A. Grover, K. P. Ismond, A. D. Good and W. J. Peacock, “Molecular Strategies for Improving Waterlogging Tolerance in Plants,” Journal of Environmental Botany, Vol. 51, No. 342, 2000, pp. 89-97. D. Catling, “Rice in Deep Water,” Macmillan, London, 1992. M. M. Sherif and V. P. Singh, “Effect of Climate Change on Sea Water Intrusion in Coastal Aquifers,” Hydrological Processes, Vol. 13, No. 8, 1999, pp. 1277-1287. CAPMAS, “2008 Census: Damietta Governorate,” Central Agency for Public Mobilization and Statistics, Cairo, 2008. CAPMAS, “2006 Census: Dakahliya Governorate,” Central Agency for Public Mobilization and Statistics, Cairo, 2008. IDSC, Damietta Governorate, Basic Statistics about Damietta Governorate, Unpublished Report, IDSC, Damietta. EEAA, “Environmental Action Plan for Damietta,” EEAA, Cairo, 2005. C. K. Onga, J. Wilsonb, J. D. Deansb, J. Mulaytac, T. Raussena and N. Wajja-Musukwe, “Tree-Crop Interactions: Manipulation of Water Use and Root Function,” Agricultural Water Management, Vol. 53, No. 1-3, 2002, pp. 171-186. M. Du Preez, “Crop/Soil Association,” Deciduous Fruit Grower, Vol. 30, No. 8, 1980, pp. 286-299. P. J. C. Stassen and H. J. Van Zyl, “Sensitivity of Stone Fruit Rootstocks to Waterlogging,” Deciduous Fruit Grower, Vol. 32, No. 7, 1982, pp. 270-275. J. H. Terblanche, I. S. De Kock and H. J. Van Zyl, “The Influence of the Physical Soil Properties on the Selection of Rootstocks for Apricots,” Deciduous Fruit Grower, Vol. 24, No. 3, 1974, pp. 82-86. H. Ro, “Water Use of Young ‘Fuji’ Apple Trees at Three Soil Moisture Regimes in Drainage Lysimeters,” Agricultural Water Management, Vol. 50, No. 3, 2001, pp. 185-196. D. J. Chalmers, P. K. Andrews, K. M. Harris, E. A. Cameron and H. W. Caspari, “Performance of Drainage Lysimteres for Evaluation of Water Use by Asian Pears,” Hort Science, Vol. 27, No. 3, 1992, pp. 263-913. J. Doorenbos and W. O. Pruitt, “Guidelines for Predicting Crop Water Requirements,” Food and Agriculture Organization (FAO) Irrigation and Drainage Paper 24, FAO, Rome, 1977. J. Schilfagaarde, “Crop Production,” In: J. Schilfagaarde, Ed., Drainage for Agriculture, American Society of Agronomy, Madison, 1974. R. J. Oosterbaan, “Frequency and Regression Analysis of Hydrological Data,” In: H. P. Ritzema, Ed., Drainage Principles and Applications, Publication 16, 2nd Revised Edition, International Institute for Land Reclamation and Improvement (ILRI), Wageningen, 1994. M. A. Kahlown, M. Lgbal, A. Raoof, and M. Hanif, “Impact of Water Logging on Major Crop Yields: A Case Study in Southern Punjab,” Journal of Drainage and Water Management, Vol. 5, No. 2, 2001, pp. 1-7. Drainage Research Institute (DRI), “Detailed Study of SLR Impacts on Drainage Infrastructure and Potential Adaptation Options Report (Unpublished Report),” August 2011. 1The extent of the alteration of reproductive growth varies with plant species and genotype and with the time and duration of flooding. 2Other impacts of climate change on agricultural yield in the Mediterranean, Which are out of the scope of this study, may include the direct positive effects of CO2 on crops as well as adverse impacts on productivity caused by shortening of the growing period, with subsequent negative effects on grain filling . 3It is worth mentioning that Damietta governorate development plan (1997-2017) was aiming, among other objectives, to develop the agriculture and fish production sector so that it would provide additional 17,050 job opportunities by 2017 . However, such a trend could be seen as over-optimistic, as the sector is already suffering from serious problems. 4The mixing of Nile water with drainage water is practiced widely by farmers at the end of the irrigation canals due to limited fresh water available for irrigating their land. 5It worth mentioning that groundwater table depths projection was undertaken in collaboration with the Coastal Research institute (CoRI). 6This implies that no autonomous adaptation options would be under- taken by the farmers. Though this is a strong assumption but is needed to estimate the real extent of the effects on agricultural productivity.